Veronica Roth’s novel Divergent is an incredible dystopian story about Tris’s (Beatrice), self discovery and the true meaning of courage. The future version of Chicago that Tris has been living in has been peaceful for years. Her society has divided up into five faction to ensure that everyone lives peacefully. The factions are: Candor (honesty is the only way), Abnegation (always being selfless), Dauntless (putting bravery before everything), Amity (living peacefully at all times), and Erudite (continually seeking knowledge). Tris was born into the Abnegation faction of her society. This means that she puts selflessness above everything. However, it has never been an easy task for Tris and at her Choosing ceremony she has to decide if she is Abnegation or Dauntless. This one decision alters the course of her life and perhaps her entire society’s philosophies and well being. This book is great! I was slightly concerned in the beginning of the book because it was a little slow moving as we learned about the different factions and met Tris. However, this quickly changed once she chose a faction. I loved how Roth developed her characters through the book. Tris started out so meek and unsure of herself and grew into a force to be reckoned with. Not only did she become strong physically but her beliefs of right and wrong became clearer to her even as things grew more complicated. I also loved the drama that comes with the question, does the cute boy hate me or like me? This is such a universal question, whether it be in a contemporary fiction, fantasy, or dystopian novel no one ever seems to know who likes who. Okay, we knew Four liked Tris, but it was fun to watch it play out anyway. I am really excited to see what happens in Insurgent. The ending of Divergent got really crazy really fast and I am sure Insurgent is going to dive right into the action. This is a must read for any YA enthusiast. This first book in Veronica Roth's #1 New York Times bestselling Divergent trilogy is the novel the inspired the major motion picture starring Shailene Woodley, Theo James, and Kate Winslet. This dystopian series set in a futuristic Chicago has captured the hearts of millions of teen and adult readers. Perfect for fans of the Hunger Games and Maze Runner series, Divergent and its sequels, Insurgent and Allegiant, are the gripping story of a dystopian world transformed by courage, self- sacrifice, and love. Fans of the Divergent movie will find the book packed with just as much emotional depth and exhilarating action as the film, all told in beautiful, rich language. The paperback edition includes exciting bonus materials: an author Q&A, a discussion guide, a Divergent playlist, faction manifestos, quiz questions, writing tips, and a peek of the second book in the trilogy. One choice can transform you. Beatrice Prior's society is divided into five factions-Candor (the honest), Abnegation (the selfless), Dauntless (the brave), Amity (the peaceful), and Erudite (the intelligent). 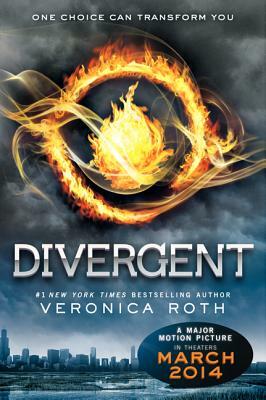 Beatrice must choose between staying with her Abnegation family and transferring factions. Her choice will shock her community and herself. But the newly christened Tris also has a secret, one she's determined to keep hidden, because in this world, what makes you different makes you dangerous.